Jon Adams' Web comic, "Chief O'Brien," follows the exploits of Star Trek: The Next Generation's Chief O'Brien, responsible for beaming crewmembers on and off of the ship. A new graphic novel delves into O'Brien's day-to-day life. While fans of "Star Trek" love to talk about "away missions" to the surface, a new Kickstarter campaign asks you to consider the lonely crewmember left behind who must beam the crew to and from the planet. Chief O'Brien, played by Colm Meaney in "Star Trek: The Next Generation" (TNG) and "Star Trek: Deep Space Nine", was responsible for the crew's Transporter needs, and he seemed to spend most of his time in the TV series standing on the TNG transporter room, waiting for instructions. 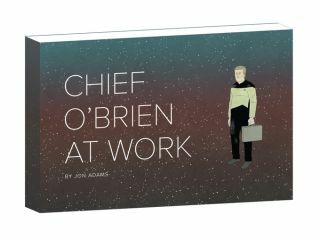 After running a parody Web comic on the topic called "Chief O'Brien At Work" since 2014, author Jon Adams is creating a graphic novel based on the Chief's workday in the "Star Trek" universe. The Web comic has already garnered the attention of "Star Trek" stars Wil Wheaton (from "TNG") and Jeri Ryan ("Star Trek: Voyager"), who each shared it with fans on Tumblr and Google+, respectively. Meaney has also seen a copy of the comic at least once, according to a picture on the Kickstarter page. A fan printed out one of the strips for Meaney to sign at a comic convention. With eight days to go in the crowdfunding campaign, the book has more than doubled its initial $15,000 goal (reaching $36,675 as of this post). The softcover book will be 128 pages long and will include brand-new comics — including "scenes outside of the transporter room," the Kickstarter page promises. Jon Adams' Web comic, "Chief O'Brien," follows the exploit of the titular Star Trek: The Next Generation character. Adams is also the author of a comic called "Truth Serum," which was nominated for two Eisner awards given for achievement in American comic books. He has written cartoon shorts for MTV and designed several books, including "Cyborg 009" and "The Joyners in 3D."